The years 1947-1948 were years that the Jewish People were waiting and praying for. My Brother's Keeper tells the story of one of the best kept secrets about the evolving story of the re-creation of the Sovereign State Of Israel. A group of 4,400 volunteers from 56 countries, Jews and Christians,volunteered to join the fledgling Israel Defense Forces. Some of their stories of their experiences sixty-two years ago will describe to you those days in 1947 and 1948 when the fate of Israel and the Jewish People hung by a thread and a prayer. These volunteers flew the planes that brought the armament, aircraft, and weapons from Czechoslovakia, the only country in the world willing to sell weapons to Israel. They were the first commanders of the Navy, the first tank commanders, the first Air Force bombers and fighter pilots, and the first General of the Army. There are stories which can never be told directly about other volunteers and their sacrifices since those unsung heroes lie in military graves, and we will never forget them. Nor should we forget that the Yishuv who made up the ground forces defended a country, without whose lost blood, Israel would not exist today. Almost 1% of the entire population of Jewish Palestine, close to six thousand Israelis lost their lives defending Israel during it's War Of Independence. So the saga goes on, and hopefully a lesson is learned about unity, determination and dedication. "Never Again." "Never Again." 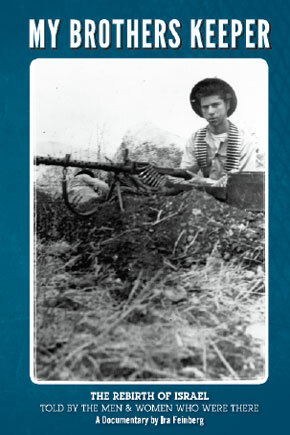 Ira Feinberg was the first American to enlist in the Palmach (Israel’s first combat forces) from the group of volunteers in 1948 sent by Land & Labor, the cover organization administrating and organizing American & Canadian volunteers to serve in Israel’s fledgling army. Born in February of 1930, Mr. Feinberg grew up in New York City in the Bronx and Brooklyn communities, and graduated from James Madison High School in Brooklyn in early 1948. Dispatched to the DP camps in southern France he arrived in Israel in April of 1948, and together with four other Canadian comrades, joined the First Battalion Palmach in Rosh Pinah in northern Israel. He later volunteers to serve as a machine gunner in the Jerusalem front in the fourth Battalion Palmach, Haportzim, on Israel’s so called “Burma Road” , and helped liberate the besieged city of Jerusalem of ninety thousand residents isolated from the rest of Israel. Upon returning to the United States he attended Brandeis University for two years, and in 1950 was drafted into the American Army during the Korean War. He then enlisted for a three year tour of duty where he graduated from the Army Language School in Monterey with a fluency in both Arabic and Hebrew. A graduate of Queens College in Speech-Theatre he toured the United States from coast to coast appearing in over five hundred Jewish Communities in support of Israel Bonds where he sold millions of dollars of Bonds, and raised large sums of funds for The United Jewish Appeal. He has shared platforms with Vice President Alban Barkley, Supreme Court Justice Douglas and other distinguished senators and congressman. In 1960 he entered the Soviet Union to learn and report on his clandestine findings of the conditions of Soviet Jewry. He visited Tunisia, Morocco, and covered the Algerian War, and wrote about the need for immigration from both North Africa (Tunisia, Algeria, & Morocco), and the Soviet Union, and how urgent action was necessary immediately to fulfill that program. He studied at The Stern School of Business for his Masters Degree in Business Administration, and later joined a number of Wall Street firms as a stock broker. Mr. Feinberg studied film production at NYU and The School of Visual Arts. His film production company “Cinema Angels” produced the documentary “My Brother’s Keeper’s” where he wrote the screen play, worked on the editing, and did the voice over for the film. He presently manages four marketing companies in an array of products and services.